Just a stroke away from the most popular and beautiful beach of the island,George's and Jenny's apartment is ideal for pleasant vacation close to the sea.Relax in a quiet and friendly environment and enjoy our facilities in a fully renovated apartment. We provide everything you need to make a nice breakfast or lunch,free parking,internet access,linen,shampoo,hair dryer,iron,dvd player and many other facilities.Our apartment has 2 private balconies,2 bathrooms and a baby bed if is needed. 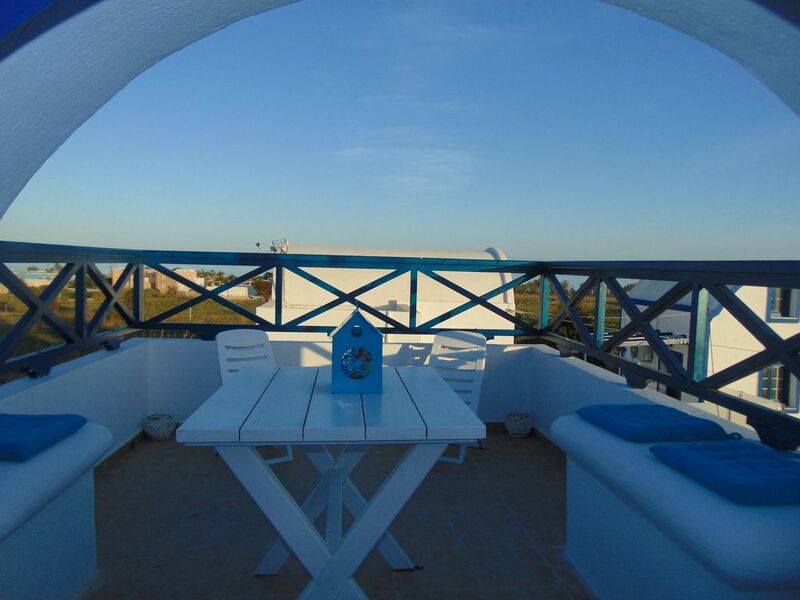 Perivolos is the most famous black beach of Santorini with many restaurants,beach bars and shops to spend your day for all tastes.Fira town is 12 kilometres from our apartment and you can go either with bus, or by car or bike. We enjoyed being in this apartment in a quiet part of the island. We rented a car, which I would recommend. It was easy to drive anywhere. Make sure you go to Dodo's on the beach - for breakfast, lunch, dinner, or drinks. Free lounge chairs with umbrellas - so relaxing!!!! One thing would be nice - written instructions (in English) for the washing machine. George said to ask the cleaning lady. It was a couple of days before we were there when she came, and then she didn't speak english. George was very helpful in arranging transfers, excursions. The apartment got cleaned daily. 5 minutes walk to the beach with plenty of restaurants. Second bedroom is very small with low ceiling, quite inconvenient. Très agréable en cette saison. Appartement bien situé à 400m de la plage de sable noir. Nécessite plutôt une voiture pour se déplacer. Appartement conforme à la description. Très bon accueil de Georgios. Very nice appartmemt 5 min walk to the beach. 5 min drive to the supermarket. Sejour debut octobre avec plages et balades. Appartement correspondant au descriptif. Georgios toujours attentif pour satisfaire ses locataires et de bon conseil pendant le séjour. A recommander. Everything was perfect! The house is just five minutes to Perivolos beach and near to the most beautiful and famous beaches of the island. It is also very clean and comfortable. George is a great host, he helped us to rent a car and with the transfer from the airport. He gave us some good information and all that we need in the house.